is a tool to generate Cartesian X/Y-plots from scientific data. I say Rt-Plot is excellent software, nice and clear in use, with a friendly interface that can help you anytime you need to enter and calculate tabular data or simply make a plot. The design and user interface of the program enables you to enter and calculate tabular data. You can view the changing graphs, including linear and non linear regression, interpolation, differentiation and integration, during entering the data. A powerful reporting module generates ready to publish documents. The centre of all activities is the Data Table. This window holds a table of all the numerical data. This window is also the central to load and save data. The columns of this table can be used to enter numbers or to show calculated values within so called “live columns”. These columns can be the base of other calculated columns and can be the source of the data used for a line in a graph. This is done by assigning the columns to X- or Y-Axis values of data series within a graph. The columns can also be assigned as the values used for a statistical weight within regression line calculations and dimensions of error bars around the data points. 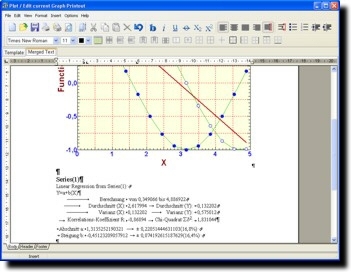 The assignments used to show the data within the graphs are visible in the top lines, and can be altered to an unlimited number of series and graphs. The numerical data are represented within at least one Graph Window. This window shows the graphs of all assigned column data. The options of the lines, symbols and calculation parameters can be altered directly at the right. All the dimensions, colors and styles of the graph, the axis and legends can be altered. 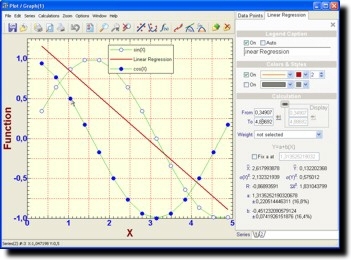 The Graph Window also contains the functions for adding calculated lines as linear, non linear regression, interpolation, smoothing, differentiation and integration. 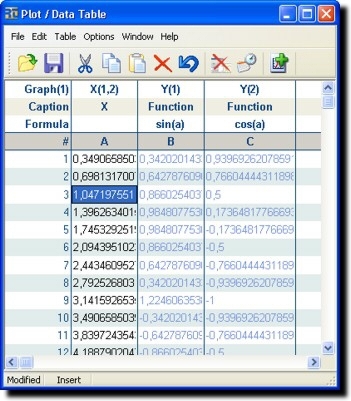 The Reports can contain any calculation result related to the added function lines and the graph. It is processed by merging a template document with the actual data. These documents are freely editable with options similar to those of your favorite word processor. The program is distributed as freeware. You can download the fully working program here.